Martin Bormann was born in Halberstadt, Germany, on 17th June, 1900. the son of post office employee Theodor Bormann (1862–1903) and his second wife, Antonie Bernhardine Mennong. Bormann dropped out of school to work on a farming estate in Mecklenburg. 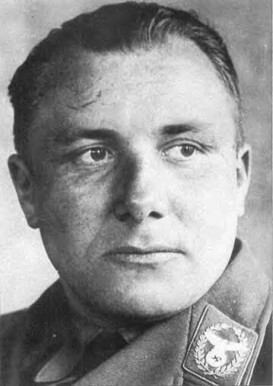 After serving briefly as a cannoneer in a field artillery regiment at the end of World War I, Bormann subsequently joined the rightist Rossbach Freikorps in Mecklenburg and was connected with the so-called 'Feme' murders. In March 1924 he was sentenced to one year's imprisonment as an accomplice of Rudolf Höss in the brutal, vengeance murder of Walther Kadow (his former teacher at elementary school), who had supposedly betrayed the proto-Nazi martyr Leo Schlageter to the French occupation authorities in the Ruhr. On September 2, 1929, Bormann married 19-year-old Gerda Buch, whose father, Major Walter Buch, served as a chairman of the Nazi Party Court. Bormann had recently met Hitler, who agreed to serve as a witness at their wedding. 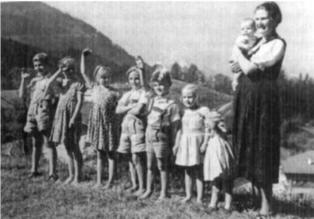 Over the years, Gerda Bormann gave birth to ten children; one daughter died shortly after birth. He then entered the NSDAP, becoming its regional press officer in Thuringia and then business manager in 1928. From 1928 to 1930 he was attached to the SA Supreme Command and in October 1933 he became a Reichsleiter of the NSDAP. A month later he was elected as a Nazi delegate to the Reichstag. In October 1933, From July of that year until 1941, Bormann served as the personal secretary for Rudolf Hess. During this period Bormann honed his beaueaucratic skills and earned the trust of Adolf Hitler. In addition to administering Hitler's personal finances, buying the Berghof at Berchtesgaden and running it as well as the whole complex of properties on the Obersalzberg, Bormann acquired the power to control the living standards of Gauleiters and Reichsleiters, not to speak of members of the Fuhrer's intimate circle. Bormann's brutality, coarseness, lack of culture and his apparent insignificance led the Nazi Old Guard to underestimate his silent persistence and ability to make himself indispensable. Rudolf Hess's flight to Britain opened the way for the 'Brown Eminence' to step into his shoes on 12 May 1941 as head of the Parteikanzlei and to gather the reins of the Party into his own hands and steadily undermine all his rivals for power. Until the end of the war, the short, squat Bormann, working in the anonymity of his seemingly unimportant office, proved himself a master of intrigue, manipulation and political in-fighting. 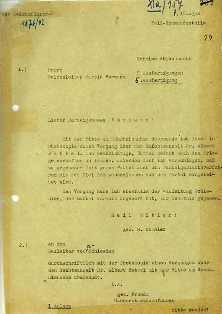 At the Nuremberg trials, Arthur Seyss-Inquart, the Reich Commissioner for The Netherlands, testified that he had called Bormann to confirm an order to deport the Dutch Jews to Auschwitz, and further testified that Bormann passed along Hitler's orders for the extermination of Jews during the Holocaust. A telephone conversation between Bormann and Heinrich Himmler was overheard by telephone operators during which Himmler reported to Bormann about the extermination of the Jews in Poland. Himmler was sharply rebuked for using the word "exterminated" rather than the codeword "resettled," and Bormann ordered the apologetic Himmler never again to report on this by phone but through SS couriers. On 29 April 1945, Wilhelm Burgdorf, Joseph Goebbels, Hans Krebs, and Bormann witnessed and signed Hitler's last will and testament. 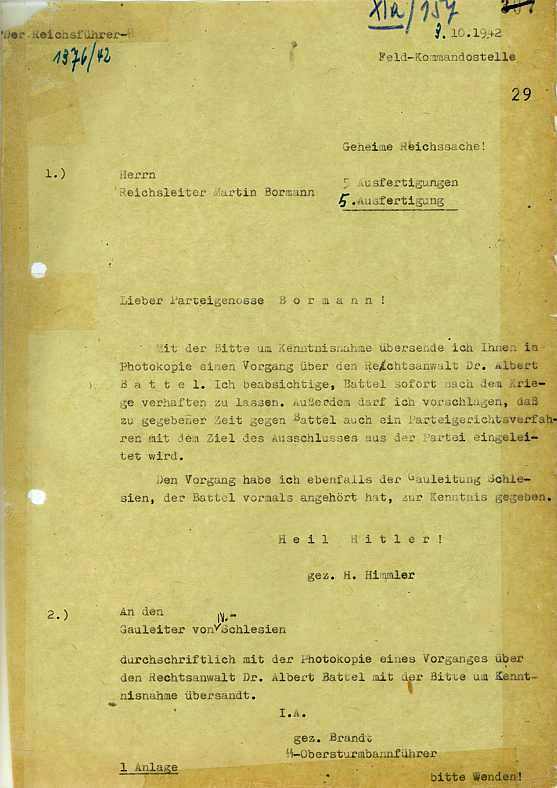 Hitler dictated this document to his personal private secretary, Traudl Junge. Borman was Head of the Party Chancellery (Parteikanzlei) and was also the private secretary to Hitler. Late on 30 April, as the Soviet forces continued to fight their way into the center of Berlin, Hitler married Eva Braun in the Führerbunker. Hitler and Braun then committed suicide. Braun committed suicide by taking cyanide and Hitler by shooting himself. Per instructions, their bodies were taken to the garden and burned. In accordance with Hitler's last will and testament, Joseph Goebbels, the Minister for Public Enlightenment and Propaganda, became the new "Head of Government" and Chancellor of Germany (Reichskanzler). At 3:15 am on 1 May, Reichskanzler Goebbels and Bormann sent a radio message to Dönitz informing him of Hitler's death. Per Hitler's last wishes, Dönitz was appointed as the new "President of Germany" (Reichspräsident). Goebbels committed suicide later that same day. According to Erich Kempka (Hitler's chauffeur), Bormann was killed trying to cross the Russian lines by an anti-tank shell which hit the tank in which they were trying to escape, causing it to burst into flames. Kempka, who was temporarily blinded at the time, claimed nonetheless to have seen Bormann's dead body. At 23:00 hours the mass escape began. Moving in small groups, they proceeded underground, as planned, to the Friedrichstrasse station. 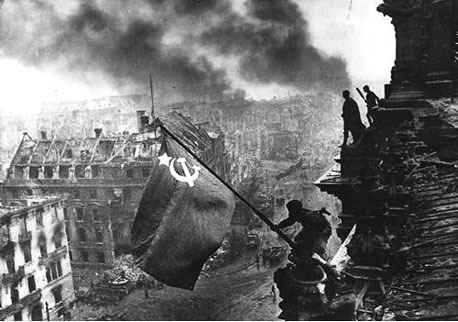 Here they emerged to find the ruins of Berlin in flames, and Russian shells bursting everywhere around them. The first group managed to cross the river Spree by an iron footbridge that ran parallel to the Weidendammer Bridge. The remaining groups likewise emerged at the Friedrichstrasse Station, but there became confused and disoriented. They made their way north along the Friedrichstrasse to the Weidendammer Bridge, where they found their way blocked, at the bridge's north end, by an anti-tank barrier and heavy Russian fire. They next withdrew to the south end of the bridge, where they were soon joined by a few German tanks. Gathering about the tanks, they again pressed forward. Bormann, Artur Axmann (head of the Hitler Youth), Ludwig Stumpfegger (Hitler's surgeon), and others followed the lead tanks as far as the Ziegelstrasse. There a panzerfaust struck the lead tank. The violent explosion stunned Bormann and Stumpfegger, and wounded Axmann. All retreated to the Weidendammer Bridge. Now it was every man for himself. Bormann, Stumpfegger, Axmann, and others followed the tracks of the surface railway to the Lehrter station. There Bormann and Stumpfegger decided to follow the Invalidienstrasse east. Axmann elected to go west, but encountered a Russian patrol and returned on the path Bormann and Stumpfegger had taken. He soon found them. Behind the bridge, where the Invalidienstrasse crosses the railroad tracks, they lay on their backs, the moonlight on their faces. Both were dead. Axmann could see no signs of an explosion, and assumed that they had been shot in the back. He continued on his way, escaping from Berlin and spending the next six months hiding out with the Hitler Youth in the Bavarian Alps, where he was eventually captured. 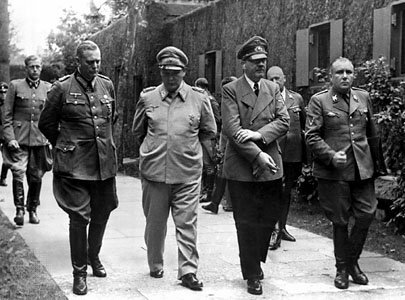 Bormann's long-time chauffeur, insisted he saw Bormann in Munich weeks after 1 May 1945. The bodies were not found, and a global search followed including extensive efforts in South America. With no evidence sufficient to confirm Bormann's death, the International Military Tribunal at Nuremberg tried Bormann in absentia in October 1946 and sentenced him to death. 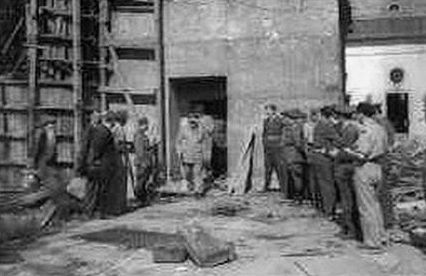 The fate of Martin Bormann remains the source of much controversies to this very day.